1920, Suma was born in Kyoto to a family who ran a printing business out of their home<ref group="note">After his father's death, Suma's uncle, Kanbee Suma, became the head of the family.</ref><ref name="star">Minomura, Kou "A Great Star Has Fallen." ''SM Collector'' Nov. 1980: 96-111. Print.</ref>. May 1939, Volunteered for the Navy in Maizuru, Kyoto<ref name="paradise">Koushi Shimokawa, ''The Paradise Trade - A History of the Essential Nature of Post War Accounts'' (Chikuma Shobo, 1998)</ref>. March 18, 1944, Suma's ship, the ''Hokuriku Maru'', sank in the Bashi Channel<ref group="note">Suma's account could be nothing but a fictional story, but a merchant transport ship called the Hokuriku Maru actually existed. The Hokuriku Maru was commissioned by the Navy in 1941 and served in the sea battles of Guadalcanal, Midway and the attack on Menado in 1942. In 1944, the Hokuriku Maru left Singapore loaded with 6700 tons bauxite, 600 tons of oil, 256 soldiers and headed toward Moji. On March 18th at 1:14 a.m., while in the China Sea roughly 300km southeast of Hong Kong, an ammunition explosion in the second hold caused the first hold to explode, which ignited and detonated the oil tanks in the third hold, reaching the engine room. Everything was lost in five minutes. 8 soldiers, 25 guards and 55 sailors perished.</ref>. 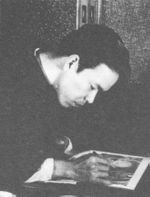 1947, summer, Kiyoshi Sugiyama, who worked at the ''Central Kyoto News'', took Suma to the editorial office of [[Kitan Club]] (Akebono Shobo), which gave Suma a chance to begin drawing illustrations for [[Kitan Club]]<ref group="note">There's a conflict in stories between whether [[Kitan Club]] was founded in 1946 or in October of 1947. A visit will be made this summer to try to confirm the latter.</ref>. There were other irregularly published pulp magazines besides [[Kitan Club]], and Suma drew illustrations for ''Jouen Shin-syu'' and others as well.<ref group="note">[[Shizuo Yagi]], who used the alias [[Mineko Tsuzuki]], took over as editor of ''Glamorous New Collection''.</ref><ref name="akita"></ref>. 1951, Toshiyuki Suma fully participated in [[Kitan Club]][Citation needed]. 1952, [[Kitan Club]] changed from a size of A5 to B5 and promoted its "abnormal" content. 1953, Suma resigned from [[Kitan Club]] and published the private fanzine called ''Tanoshimi Soushi''<ref name="akita"></ref><ref group="note">Tanoshimi Soushi earned about twenty fans and printed some 20-50 copies. The magazine continued for eight issues.</ref>. Reiko Kita's art appears in the December issue of ''[[Fuzoku Soushi]]''. 1955, With the cancellation of [[Fuzoku Soushi]], Suma begins working for ''[[Amatoria]]'' magazine (published by [[Kubo Shoten]]), and he launches ''[[Kappa]]'' the predecessor of [[Uramado]].<ref name="akita"></ref><ref group="note">The magazine changed its name due to a complaint from Koubunsha, which published Kappa Books.</ref>. 1956, Suma founded [[Uramado]] magazine, published through [[Kubo Shoten]]<ref name="eshi">Nureki, Chimuo. The Artists of Kitan Club. Tokyo: Kawade Shobo Shinsha, 2004. Print.</ref>. 1970's Suma came down with blood extravasation in brain. Commitment to rehabilitation in Spring sanatorium in Shichi-zawa, Atsuki city, Kanawaga<ref name="eshi"></ref>. * Suma's nom de plume of "Minomura Kou" was taken from the Malaysian expression, "A little rest. "<ref name="eshi"></ref>. * Suma's nomme de plume of "Minomura Kou" was taken from the Malaysian expression, "A little rest. "<ref name="eshi"></ref>.